Luke Skywalker: "He told me enough! He told me you killed him." After the surprise success of A New Hope, a sequel was inevitable. Lucas's new story turned the series into a dramatic saga with the revelation that Darth Vader was Luke's father. Since making the last film had been so stressful, he had Lawrence Kasdan and Leigh Brackett write the script for The Empire Strikes Back and had Irvin Kershner direct it. Kershner didn't know if he could top the first film, but he was determined to make the film as good as he could anyway. Though the film was initially criticized for its darker tone and Cliff Hanger ending, it was still a smash hit, and these days is widely considered the best of the Star Wars films. Adventure Rebuff: Yoda's initial response to Luke. Aerial Canyon Chase: Han Solo and the Millennium Falcon do this during the famous asteroid chase scene. As Solo was noting, "They'd be crazy to follow us." Unfortunately, Darth Vader is quite a motivator for his troops and they dive in after him. The Apple Falls Far: Look closely when Luke falls out of the chute on Cloud City and clings to a weather vane; his hand can be seen falling into the atmosphere. An Arm and a Leg: Luke, who gains an Artificial Limb at the end. Asteroid Thicket: Possibly the Trope Codifier. Badass: Darth Vader is a badass throughout the trilogy, but it is most pronounced in this film. Bad Boss: Vader personally Force-chokes two of his officers for their perceived incompetence (one of them did have lapses of judgement, but the other arguably did not), being the Trope Namer for You Have Failed Me.... And he sends several Star Destroyers into the asteroid field to look for the Millennium Falcon, causing at least one to suffer catastrophic damage. The Bad Guy Wins: Let's see, the Empire crushes the rebels at Hoth, forcing the good guys to flee. The good guys then get trapped in an asteroid field and then barely escape with their lives. Darth Vader defeats Luke in a lightsaber duel, cutting off his hand, and Han Solo is captured by Boba Fett and then frozen in carbonite to be taken to Jabba the Hutt. Are you wondering why this film is called The Empire Strikes Back, yet? Bald of Evil: The scene with Vader in his medical chamber is the first time the audience sees a glimpse of what he looks like underneath his helmet. Batman Can Breathe in Space: Sure, Han, Leia and Chewie put on some sort of breathing masks when they're walking around outside the Falcon inside the asteroid, but unless the giant space worm has its own atmosphere, decompression should've killed them. Batman Gambit: Vader wants Luke, but after the Hoth evacuation, he has no idea where to start looking for him. Instead, he pursues and captures Han and the others. While capturing them would be of value to the Empire regardless, Vader doesn't even have to bother sending out a villainous threat. He correctly anticipates Luke sensing their suffering through the Force and racing to the rescue. Big Bad: The only film where Vader holds this role, though the Emperor is still the Bigger Bad. Big Damn Kiss: In the cargo bay. There's a reason it's one of the most famous kisses in cinematic history. Big No: The most famous one in the entire series, even counting Revenge of the Sith. And after Han is frozen, we get the Wookie version of the trope. Big "Shut Up! ": Leia to 3PO after he's about to tell the odds for a second time. Bittersweet Ending: The Rebels are on the run, Han's been kidnapped, Luke's hand has been cut off, and his soul is profoundly shaken by Vader's claim to be his father, leaving the awful suspicion that his mentors, Obi-Wan Kenobi and Yoda have lied to him. But the Rebels have survived, Luke has not gone over to the Dark Side (which has deeply disappointed Vader), he and his friends escaped and the view of the galaxy signals that while this story is ending, the series continues -- the fight will go on. Yoda (to Luke as he is about to leave Dagobah): Stopped, they must be. On this all depends. Only a fully trained Jedi Knight will conquer Vader and his Emperor. If you end your training now; if you take the quick and easy path as Vader did, you will become an agent of evil. Obi-Wan (also to Luke): Patience! Luke: And sacrifice Han and Leia?! Bounty Hunter: Vader hires some when the Imperial fleet loses track of the Falcon, including Boba Fett. Broken Pedestal: Anakin Skywalker. Holy kriffing Sith, Anakin Skywalker. Carnival of Killers: The bounty hunters, including a slimy reptilian (Bossk),a cyclopean droid (IG-88), an insectoid droid (4-LOM), a creepy scuba suit-wearing bug (Zuckuss), an armor-clad and mysterious badass (Boba Fett), and Dengar. At least one Imperial officer is incensed that he's been forced to allow them aboard his ship. "Bounty hunters! We don't need their scum!" Cave Mouth: The crew of the Millennium Falcon confuse a space slug's mouth with an asteroid cave. Cryptic Conversation: Yoda and Obi-Wan's conversation about Luke's father on Dagobah make a lot more sense when seen in view of the entire trilogy, as well as the There Is Another scene. Curb Stomp Battle: The Battle of Hoth. A lot of Rebel soldiers and equipment lost, at the cost of two AT-ATs, an Imperial-class Star Destroyer, and a few Snowtroopers. Curb Stomp Cushion: The Rebels do manage to take out two AT-ATs, and a Star Destroyer is disabled (and in the Expanded Universe, later captured), breaking the blockade around Hoth and allowing the Rebels to escape and regroup. David Versus Goliath: Luke vs. Vader. Not only is Vader taller, he's also much more skilled and experienced with the Force. It's almost a Foregone Conclusion that Luke will lose. And subverted, then, since he actually doesn't. Deal With The Sith Lord: Sure, the alternative might have been the Empire arresting and/or executing everyone on Cloud City, but seriously, how could you think that was going to turn out well, Lando? Vader: I am altering the deal. Pray I do not alter it further. Disconnected by Death: During Vader's teleconference with the Star Destroyers' captains, one hologram image flickers and vanishes after the ship is struck by an asteroid. Don't Make Me Destroy You: Vader says this to Luke verbatim after he cuts Luke's hand off in their lightsaber duel. Don't Think, Feel: A core theme of Yoda's training. Electric Torture: What is done to Han and currently the trope's page image. To make it even worse, they didn't even bother asking him any questions. 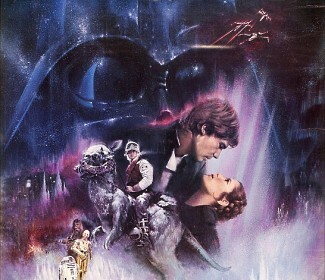 Exactly What It Says on the Tin: The Empire strikes back in a big freaking way in this film. By the end of the film, the heroes have really got their work cut out for them. "What know you of ready? For eight hundred years have I trained Jedi." —Yoda, Star Wars "Episode V: The Empire Strikes Back"
Foiler Footage: Before the movie's premiere, the number of people who knew about The Reveal could be counted on one hand: George Lucas, James Earl Jones, Mark Hamill and whatever editors Lucas trusted to see the scene. Even David Prowse, who had to say something during filming, was given the fake line "Obi-Wan killed your father." Urban Legends now abound of Harrison Ford turning to Hamill in the middle of the premiere and giving a Big "What?". Foreshadowing: The scene where Luke enters a cave on Dagobah and hallucinates about decapitating Darth Vader, and Darth Vader's face changing into his own. In hindsight, it's a clear warning of where Luke might have gone. Vader's line, "Only your hatred can destroy me," is foreshadowing of the final duel in Return of the Jedi. Four-Star Badass: General Veers, one of the few Imperial officers shown to actually be competent in the movies. Genius Bruiser: This film both emphasized not only how big of a Badass Darth Vader really is, but how intelligent he is. Princess Leia (after accidentally falling on Han's lap): Let go, please. Han Solo: Don't get excited! Han Solo: Sorry, sweetheart. I haven't got time for anything else. Grew a Spine: Luke, when he left Yoda's training to save Han and Leia. Heroic BSOD: After Vader defeats him, Luke has a major one. In the Falcon's cockpit as the heroes try to escape Vader, he's clearly filled with despair, whispering, "Ben, why didn't you tell me?" Heroic Sacrifice: Granted, the term "hero" is debatable, given that he's working on the villain's side, but Captain Needa was willing to be executed by Darth Vader for losing sight of the Millennium Falcon in order to allow his crew to live. Hero of Another Story: Boba Fett, whose taking Han Solo to Jabba was told in the Expanded Universe interquel Shadows of the Empire. According to the Star Wars Expanded Universe, the design isn't considered to be practical even in the Star Wars setting. It is, however, very effective at what it was meant to do: induce pants-shitting terror in any fools audacious enough to resist the Empire. Immune to Bullets: AT-ATs. Luke even says, "That armor's too strong for blasters." In a Single Bound: As Luke's Jedi training progresses, he learns to use new powers like the Force jump, which comes in handy during his fight with Vader. Incompletely Trained: Luke runs off before Yoda has finished training him. Insult Backfire: Leia calling Han a "scoundrel". Han: "Scoundrel"? I like the sound of that. Ironic Echo: "It's not my fault!" is said by both Han and Lando when the hyperdrive fails to work. Is That What He Told You? : Darth Vader telling Luke he's his father, contradicting what Obi-Wan had told Luke in the original film. Leia: Why you... stuck-up, half-witted, scruffy-looking... nerf-herder!! I Want Them Alive: "No disintegrations!" Boba Fett: "As you wish." Jerkass: After C-3PO gets shot, he makes the jump from innocently annoying towards Han and Leia to outright obnoxious towards Chewie and R2. [over intercom] Imperial troops have entered the base! Imperial troops have entered-- [burst of static]. Koosh Bomb: Used for a frame or two at a time. Last-Second Word Swap: When shooting the big scene between Luke and Vader, David Prowse said "No, Ben killed your father", and that's what the entire crew of the film thought would be said when James Earl Jones dubbed in his lines. Only 5 people (Lucas, Jones, Mark Hamill so he would react correctly, writer Lawrence Kasdan, and director Irvin Kershner) knew the actual line. And Hamill didn't know until they were on set and ready to film. Kershner took him aside and told him moments before. They were very determined to keep the big reveal a secret. Late Arrival Spoiler: Darth Vader is Luke's father. The prequels have effectively made it a non-spoiler now. Million-to-One Chance: "Sir, the possibility of successfully navigating an asteroid field is approximately three thousand, seven hundred twenty to one!" "Never Tell Me the Odds!" Moment Killer: Just as Han and Leia were into their first kiss, C-3PO bursts in, chattering about the reverse power flux couplings. Well, he has found the reverse power coupling. Moving the Goalposts: Lando tried to make a deal with Darth Vader, agreeing to imprison his old friend Han Solo and his companions in exchange for the Empire not killing everyone in his city. Vader kept altering the deal, because Lando realizes too late that he's completely powerless. The Musketeer: It's not as obvious as other examples of this trope but Luke carries his blaster and lightsaber into battle together (mostly evident in the climax where goes from shooting Stormtroopers to dueling with Vader). It's the only movie in which he does this as well as the only time in the entire film franchise we see a Jedi or Sith doing it. Noodle Incident: "I'm sure [Lando]'s forgotten all about that." Explained in the Star Wars Expanded Universe. Lando: Why you slimy, double-crossing, no-good swindler. You got a lot of guts coming here after what you pulled. No OSHA Compliance: Definitely shown during the lightsaber duel on Bespin. Why anyone would work there is anyone's guess. Railings seem to be very expensive to install or maintain. No, Mr. Bond, I Expect You to Dine: With Vader in Cloud City. Obfuscating Stupidity: How Yoda first acts around Luke, to ascertain Luke's mental preparedness for Jedi training. Off-the-Shelf FX: Due to the scale necessary for the Star Destroyer's bridge model, ILM used an off-the-shelf Millennium Falcon model kit for the shot where the Falcon is hiding on the back of the bridge. Both a potato and a shoe were used during the asteroid field scene. The shoe has a rumored story too - The rumor in question being that George Lucas asked the FX crew to redo the scene so many times that they got annoyed and one of them threw in their shoe. The potato can be seen in beginning of the scene in the top left corner. An Offer You Can't Refuse: Lando Calrissian had to turn Han and his friends in to the Empire, due to the alternative being to have Cloud City be attacked by the Empire and either occupied or worse, destroyed by them. The look on Piett's face when the Falcon finally gets the hyperdrive fixed just before the Star Destroyer can lock on the tractor beam. He knows the price of failure: Vader Force-chokes you. Luckily for Piett, Vader is more disappointed than angry. Cpt. Needa when they lose the Millennium Falcon (hiding on the Destroyer's surface itself), and realizing he has to own up to Vader that he let them get away. Needa: I shall assume full responsibility for losing them, and apologize to Lord Vader. C-3PO, before he got blasted. Oh my. I am terrible sorry I didn't mean to intrude no-no please don't get up-- [*BLAST*] NO! The look on Hobbie's face when Leia reveals the escape plan from Hoth. Percussive Maintenance: Han pounding on the Falcon fixes a short in the systems. Plot-Driven Breakdown: The hyperdrive on the Falcon always fails just in the nick of time. Plummet Perspective: It's a long way down from Cloud City. If you know anything about gas giants, it's even worse, as there's really no bottom; you'd just keep falling until the atmospheric pressure crushes you. Precision F-Strike: during the the following conversation between Han and a rebel technician. Rebel technician (to Han): Your tauntaun will freeze before you reach the first marker. Rule of Three: C-3PO describing the ridiculous odds against whatever Han Solo's trying to do. The Millennium Falcon failing to jump into hyperdrive when needed. Vader choking his subordinates for failing him. Running Gag: Again, the hyperdrive on the Falcon failing. By the third time, Leia and Chewie just kinda look at each other, neither one of them surprised at all. Eventually, Chewie goes into a rage, and Leia just does a Face Palm. Sadistic Choice: See Deal with the Devil and An Offer You Can't Refuse above. Sci-Fi Writers Have No Sense of Scale: The Falcon somehow got to Bespin when its hyperdrive was broken, which should have taken months, if not years, at sub-light velocities unless it was in the same star system as Anoat. This was Retconned in the Expanded Universe to actually take months (as well as giving Luke plenty of time for Jedi training). Second Chapter Cliffhanger: Perhaps the Trope Maker for ending the second installment of a Two-Part Trilogy on a Cliff Hanger. Sequel Escalation: The movie has more locales, more action, and features the first Luke/Vader lightsaber duel. While the Force in the first movie was vaguely defined telepathic powers, The Empire Strikes Back shows the Force can also give you telekinesis, superhuman physical abilities and low-grade clairvoyance. Shipped in Shackles: Han Solo is frozen in carbonite for his trip to Jabba the Hutt. Vader plans to use the same procedure on Luke so he can be taken to the Emperor without escaping or fighting back. Slap Slap Kiss: Han and Leia. Soul Brotha: Lando Calrissian, who gives Solo a run for his money in the charm and cool department (and puts the moves on Leia, who's uninterested). Space Suits Are Scuba Gear: In this case, they're face masks attached to an oxygen tank. Stern Chase: The cat-and-mouse between the Falcon and the Imperial fleet. The Stool Pigeon: Lando Calrissian was forced by the Empire to sell out Han Solo and his friends to the Empire because they threatened total occupation/total annihilation of Cloud City if he didn't. In other words, he's closer to the Lacerated Larry type. Taking the Bullet: Captain Needa sacrifices himself to a Force Choke to save his crew from Vader's wrath. That's No Moon: The sandworm masquerading as a harmless cave. C-3PO (conversing with R2-D2): "Why didn't we just go into lightspeed? We can't? How would you know the hyperdrive has been deactivated?! The city's central computer told you? R2-D2, you know better than to trust a strange computer!" Training from Hell: Fond of it, Yoda is. And steal your lunch, he will. Try and Follow: Han rushing into the asteroid field at full speed. Un Paused: C-3PO is damaged by Imperial stormtrooper fire. When he's repaired and reactivated, he replays what he was saying and thinking when he was attacked. Villains Never Lie: Except when they do. We Can Rule Together: Vader offers this to Luke. Well, Excuse Me, Princess! : Han and Leia, in spades. Wham! Episode: Okay, even though it's not a secret any more, Vader being Luke's father was a huge shock when the movie came out. And all the rest of the stuff at the end. Also "There Is Another", which resulted in a lot of debate at the time. Han was a favorite candidate. Wham! Line: Vader's parental revelation. Why Don't You Just Shoot Him? : Han tries immediately. Vader simply blocks the shots with his hand, then Force-pulls the blaster away from Han. You Killed My Father: Famous subversion. From A Certain Point of View.